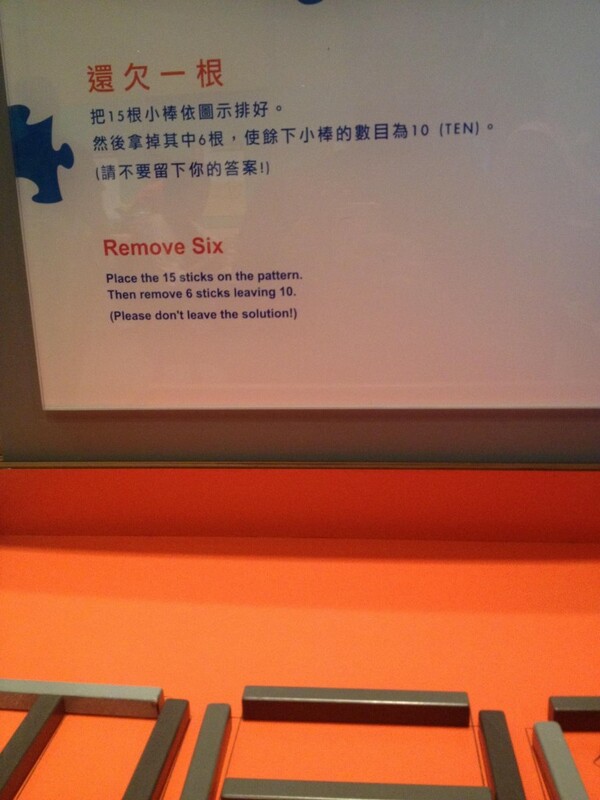 Last October I visited the Hong Kong Science Museum while staying with some friends. It was a fun thing to do with little kids and interesting to note the differences and similarities to OMSI — a science museum we have here in Portland that I used to work at for a short while. Mostly I enjoyed the puzzles and brain-teasers like the Tower of Hanoi, pyramid puzzles, tangrams and the like. Spoiler: you remove the blocks to spell the word TEN. On your first attempt, if you're a native English-speaker, you're probably thinking about the quantity of sticks left and not spelling the word. Result: Brain. Successfully. Teased. But because the solution is dependent on English they needed to provide more of a hint in the Chinese explanation.